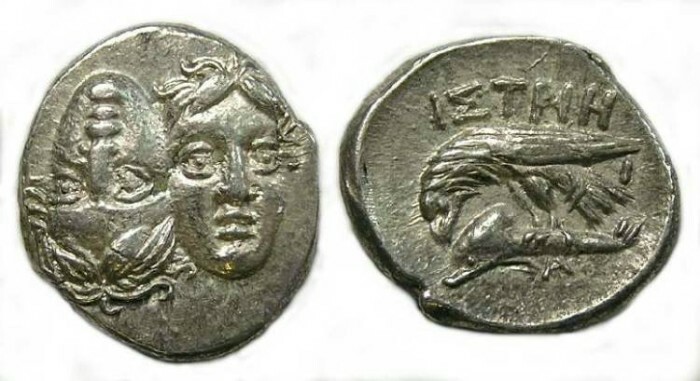 Thrace, Istros. Silver stater. ca. 400 to 350 BC. Istros in Thrace, ca. 400 to 350 BC. Reference : Sear Greek - 1669 variety. Size : 17.6 x 20.0 mm. Weight : 5.45 grams. Grade : XF (a little nicer than the image suggests). Obverse : Two male heads, side by side with one inverted. Reverse : Sea-eagle standing left on the back of dolphin, with IΣTPIH above and a small A below.